This is waaaay tight! This album is so solid you just have to pick it up if you like Eligh. There are some certified bangers on here such as 'Actors', the 'Chronik' and many more. Check this one out for sure. Don't regret not getting this one, its probably his most recognized album...and for good reason too. Eligh's been in the game for a minute now. Starting out as The Grouch's "apprentice" back in 1996, Eligh's contribution to the Living Legends crew is massive. 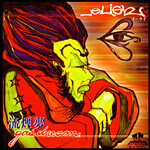 I've been saying it for years - Eligh is one of today's top beat-makers. And this album is somewhat of a masterpiece among his overflowing discography. In fact, Eligh produces much of the crews other work, including all the 3 Melancholy Gypsys material, a ton of the collective's material, and plenty of other solo and group albums within the crew. This is Eligh's 5th album, and arguably his best. Though I like his newest effort "Enigma" more, I usually find myself grabbing for this one the most. The album holds a very strong concept. It focuses on all the "Gas Dreamers" out there looking to make a quick buck in the music industry. He dissects the mentality of the gas dreamer at every angle. It may seem like a played out concept, but I've never heard it utilized in such a poetic and insightful way. Eligh is extremely intelligent, and although he reaches into abstraction a bit with his lyrics, he stays grounded in entertaining the listener with dope beats and flows. The beats are very strong here, and there are some undeniable standouts here, including "A Gas Dreamer's Intro", "Lifesize Puzzle" featuring Scarub, "Forks In The Road", "Mingus And Me" featuring Sunspot Jonz & Luckyiam.PSC, "A Lesson Garden" featuring Del the Funky Homosapien, "What You Do", "Night Life", "Kronik", "Soul Man" featuring Pep Love & The Grouch, & "Mission Complete" featuring Aesop. The guest appearances on here are excellent, and are captured beautifully under Eligh's dope soundscapes. Overall, this is not a Living Legends affair to be missed. This is definitely a fan favorite of Eligh's and probably the best place to start with his solo career. I would recommend "Enigma" if you like this one, as it's a bit more airtight. It's actually a combo of his hot lyricism with his beat-making alter-ego Gandalf, since much of the record contains instrumentals. The Living Legends crew are doing big things in hip-hop, and this albums greatly proves that.